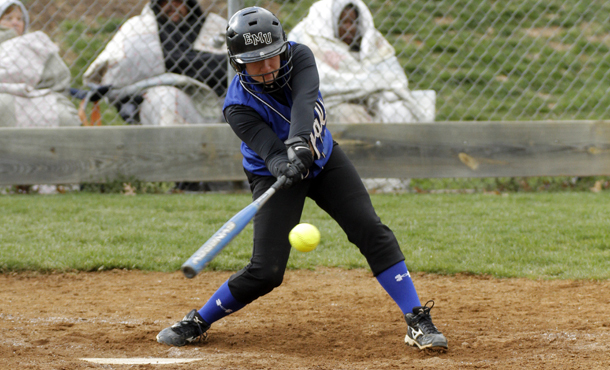 Brooke Hensley was 2-3 (Elkton, VA/Spotswood) with two runs and an RBI in game one as the Eastern Mennonite University softball team went on to complete a double-header sweep of York (Pa.) College Sunday afternoon. The pair of wins pushes the Lady Royals' record to 14-2 on the year. EMU’s softball women got busy building another winning streak Sunday, taking apart the York (Pa.) Spartans. The Lady Royals had 11 hits in each game of the two-game sweep. After a disappointing split against Mary Washington on Saturday, the women got their bats going quickly in their home opener. Lisa Lee (Buckingham, VA/Buckingham County) led off with a double and the hit parade started. The Lady Royals put together five hits, including a three-run homer from Sara Jenkins (Stanley, VA/Page County). Molly Smith (Elkton, VA/Spotswood) drove out a two-run blast to start an eight-run second. EMU put together five hits with three walks and closed out their second big inning with back-to-back sacrifice flies to push the lead to 13-0. The women left the bases loaded in the third, but it didn’t matter as the Spartans only managed one run in the mercy-shortened game. Eastern Mennonite had 11 hits and eight walks in their four at-bats. Jenkins finished 3-3 with her second homerun. The junior scored twice and had four RBIs. Brooke Hensley was 2-3 (Elkton, VA/Spotswood) with two runs and an RBI. Courtney Allman (Mt. Solon, VA/Fort Defiance), Jordan Aylor (Madison, VA/Madison County) and Rasheeda Crews (Brookneal, VA/William Campbell) each scored twice as well. Lee threw the complete game to improve to 6-1. She scattered four hits and struck out two. The Spartans got on board in their first at-bat in game two, putting together a pair of hits to go ahead 1-0. The Lady Royals batted around in the third and took the lead with four two-out runs. Smith and Jenkins each hit RBI singles, and Crews added a two-run single. York scored a run in the fourth, but EMU got it back in the fifth when Allman lofted a leadoff homerun over the left field fence to make it 5-2. The visitors threatened in the sixth, but had a runner thrown out at home to end the inning. The Spartans got a two-out single in the seventh, but Aylor threw her third consecutive scoreless frame in relief to preserve the three-run win. Smith started in the circle and pitched four innings to improve to 4-0. Aylor earned her first save with three innings of work. Lee was 3-4 from the plate to lead an 11-hit attack. She hit two doubles and a triple while scoring one run. Allman hit her team-best fifth homer of the year and finished 2-3 with two runs and an RBI. Crews was 2-3 with a pair of RBIs and Jenkins also had a pair of hits with one RBI. Eastern Mennonite is now 14-2 and continues their homestand with Hood on Tuesday. First pitch from Gehman Field is 3 p.m.